Just a guess, but perhaps they include on street bike lanes including some sections where there is not accompanying sidewalk or MUT. As a BlackBerry user, I am a fan of "hidden" efficiency techniques and features. On their keyboard phones, pressing certain letters would do key tasks more quickly than using a menu, but these functions were not readily explained. If these signs have such features, simple design notes that communicate a great deal of extra information in quick form, that would be great. But I would like for there to be a clear explanation of all these design details somewhere for easy public consumption. Exactly! These signs have an inconsistent and somewhat incoherent design. The vertical signs show distance and time for pedestrians and cyclist, e.g. 1.9km, 23min and 8min. But the horizontal signs show only distance. That would be fine if the column heading didn't show a bicycle icon. What's that supposed to mean? That this isn't a pedestrian route? That the distances for pedestrians are different (and if so what are they)? Why does that column need an icon in the first place? Isn't something like 0.9km self-explanatory to both pedestrians and cyclists? I've always interpreted the bicycle in those signs which are quite common in Europe to indicate that there is a bike path taking you all the way there. In my experience in central Europe paths and trails are generally open to both modes of transport unless explicitly signed otherwise. AFAIK the paths along Waterloop are all dual-use. In Europe signs on such dual-use paths generally show destinations and the time(*)—not distance—required for a typical pedestrian to reach them. The horizontal signs along Waterloop shown above suggest that pedestrians aren't welcome. Is that really the impression we want to leave with path users? I don't think so. (*) Time is generally more useful than distance in Europe because the terrain is more varied. Time factors in the difficulty of traversing that terrain. That's usually not an issue in Waterloo Region so distance makes more sense here. (12-10-2014, 11:35 AM)ookpik Wrote: Quite common where? In my experience in central Europe paths and trails are generally open to both modes of transport unless explicitly signed otherwise. Slow down. I'm saying the bicycle indicates there is a paved path all the way there. That is, you won't have to cycle on a street/road or gravel to get there. Nothing to do with pedestrians, all to do with cars. Yes pedestrian and bicycle paths are shared in Europe, and quite safely. This is not possible here, because the laws of physics are different in imperial measures. As such we would have untold casualties if pedestrians and cyclists ever shared the sidewalk. So it's illegal to do so. Instead we do the safe thing which consists of placing a 15kg light vehicle on two slim tires traveling at 15 km/h next to a vehicle weighing 1,000+ kg on four broad tires traveling at 50km/h. You know our motto here in North America: safety is our number one priority. (12-10-2014, 11:54 AM)BuildingScout Wrote: Slow down. Quote: I'm saying the bicycle indicates there is a paved path all the way there. That is, you won't have to cycle on a street/road or gravel to get there. Nothing to do with pedestrians, all to do with cars. I appreciate that asphalt is generally better but are you saying that cyclists won't use gravel or dirt paths? That's news to me. And what does any of this have to do with cars? These trails aren't for them. More relevant is the status of electric and gas powered bicycles. Should they be allowed on dual-use paths like Waterloop? (12-10-2014, 12:24 PM)ookpik Wrote: And what does any of this have to do with cars? These trails aren't for them. More relevant is the status of electric and gas powered bicycles. Should they be allowed on dual-use paths like Waterloop? Again, what I'm saying is that by placing the bicycle sign it indicates that you can get there on dedicated paths alone. Dedicated to pedestrians/bicycles as opposed to shared roads that carry cars as well. Example, if I see a sign that says "Toronto 100Km" I would presume it includes driving on roads, whereas if it says "Toronto 100Km o+o" I interpret it that one can do it in dedicated paths all the way there. (12-10-2014, 03:32 PM)BuildingScout Wrote: Again, what I'm saying is that by placing the bicycle sign it indicates that you can get there on dedicated paths alone. Dedicated to pedestrians/bicycles as opposed to shared roads that carry cars as well. If it's "Dedicated to pedestrians/bicycles" then why not say so. Explicitly. 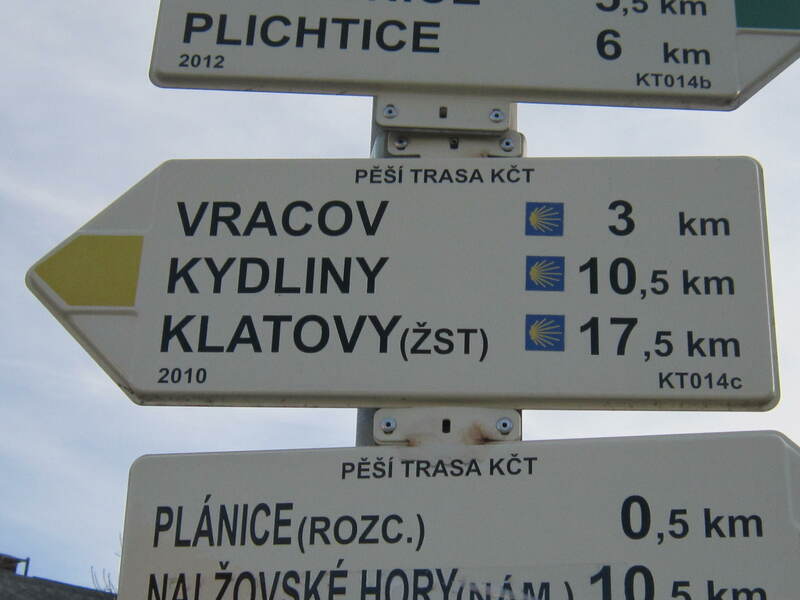 In different words, er pictures, why doesn't the sign either not have any icon associated with distance or, if it must have an icon, why isn't that icon more inclusive, e.g. the international icon for "Jointly Used Paths for Pedestrians and Bicyclists. Indicates paths restricted to and mandatory for both bicycles and pedestrians. These areas are shared by bicyclists and pedestrians, not separated with lines for each." (12-10-2014, 04:30 PM)ookpik Wrote: If it's "Dedicated to pedestrians/bicycles" then why not say so. Explicitly. 49,5km ride to Luxembourgh; better bring an ice bag for your bum. I think I will take the 2.3km to Drakenburg! .... and it's a steady climb all the way there. Not to belabour the point (too much ) but it's not. 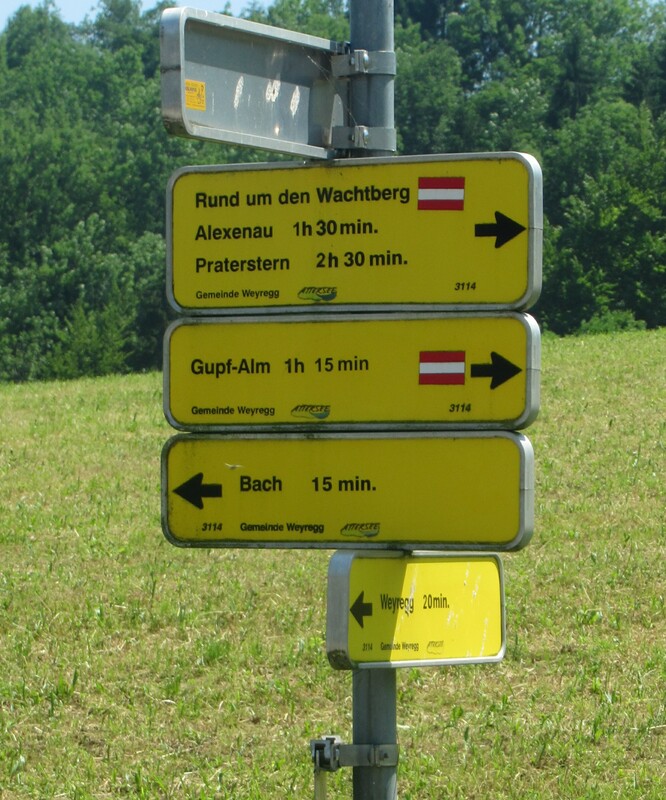 I can post numerous examples(*) of directional signs for foot paths and trails that show no icon. It's understood that those are dual-use. In my experience that's standard practice in countries like DE, AT, CH, PL, CZ, etc. unless there's an intent to exclude one or the other mode, e.g. because the path is particularly narrow or because there are two parallel paths dedicated to each mode of transport. Having only a bicycle icon is both gratuitous and misleading. While it may be welcoming to cyclists it delivers the opposite--and incorrect--message to pedestrians. 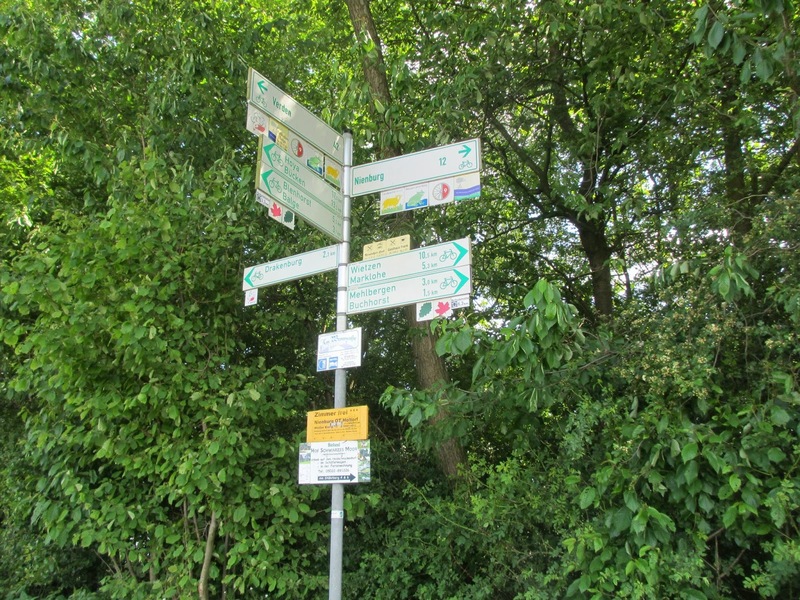 A quick query for "cycling path signage Germany" in google images confirms that the vast majority of signs include the bicycle. Again not sure why, but they do. This also matches my experience there, where I've cycled and lived for extended periods of time. This is getting far off topic, so this is the last I will post on this. (12-07-2014, 07:16 PM)Drake Wrote: Was out for a walk this afternoon. Noticed some new paving on Forwell trail and new signage. This was not here a fortnight ago. I found these signs all along the route. The city has been busy. Looks like they have done a great job on these trails. Out for a walk tonight and the formerly celebrated signs have vanished. No trace they ever existed. Not even a hole in the ground.